"Once my doubles partner and I docked and got out of our boat, I grabbed my oars and hurried to the other end of the dock to race in my second of four events: the women's open singles. I took my time getting to the start, knowing I had to race 2000 meters. As I neared the start, I heard one of the refs shout out 'Lansing!! Hurry up!!' I booked it to the starting line, got in place and awaited the call--my adrenaline kicking in for a second time. The flag went up and the race began. For the first 400-500 meters, my rate was in the 30s but towards the middle I slowed down a bit. The single on my port side kept up with me and at one point passed, but only got a few meters ahead. As we neared the last 500 meters or so, I picked up my pace, as did the other rower. I managed to squeeze into first place, but at literally the last second my energy waned and the other rower pulled ahead to finish first. With only 3 rowers in the event, I was not awarded a second place medal. Alas, I must wait until next time to claim first place." 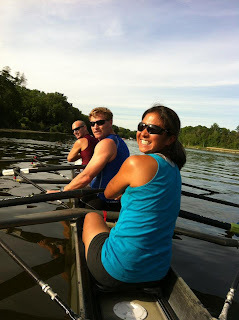 Sarah Greene started rowing at Murray State in 2001 while pursuing her Bachelor's Degree in Horticulture. While working with Michigan State University' Landscape Services, she returned to rowing with the Lansing Rowing Club in 2010 where she has continued to train and compete. It's always a thrill to hear of Murray State alums who picked up rowing while in school and continue with it as a lifetime sport. Way to go Sarah! Have you got a recent rowing story? Please share it with the Racer Rowing Society!